TOM AND DeLORES JOHNSON never reached their storm shelter late Friday afternoon, July 1, when an EF-1 tornado blew into Belview. They didn’t have time. But for the Johnsons, that turned out to be a good thing. 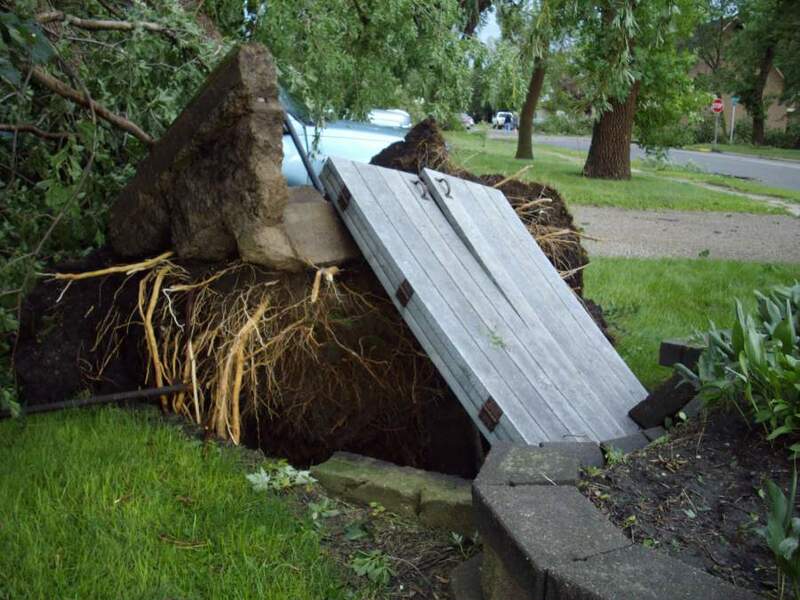 “The storm shelter was ripped up by the big tree that stood next to it…we would have been injured or possibly killed if we would have been in it,” DeLores surmises. Instead, they managed to seek protection in the basement of their 1898 home. The storm cellar where the Johnsons would have sought protection had they had time to reach it. 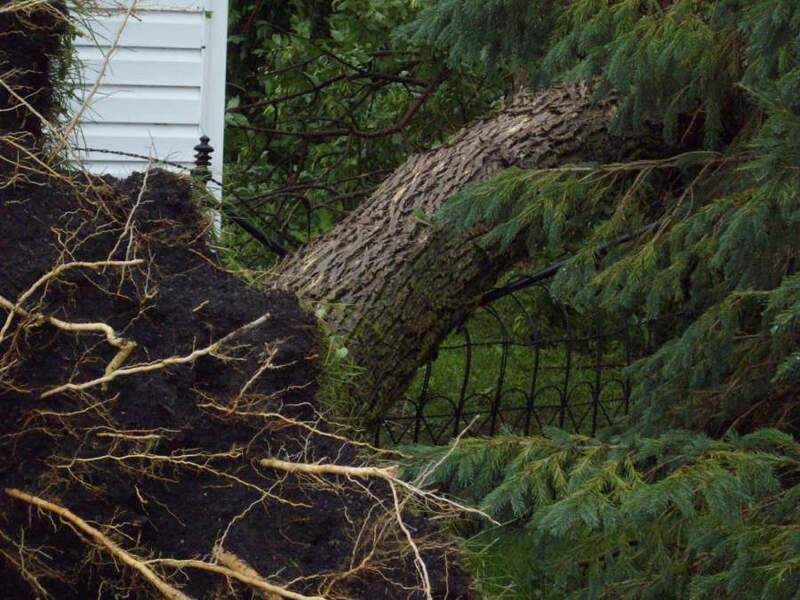 “We are grateful to be alive,” DeLores says, a statement likely echoed by other rural and small-town residents in southwestern Minnesota where a wide-spread July 1 storm spawned four EF-1 tornadoes and a more powerful EF-2 twister. Belview was among the communities hardest hit when the tornado, with winds of 95 – 105 mph, ravaged this town of 375. 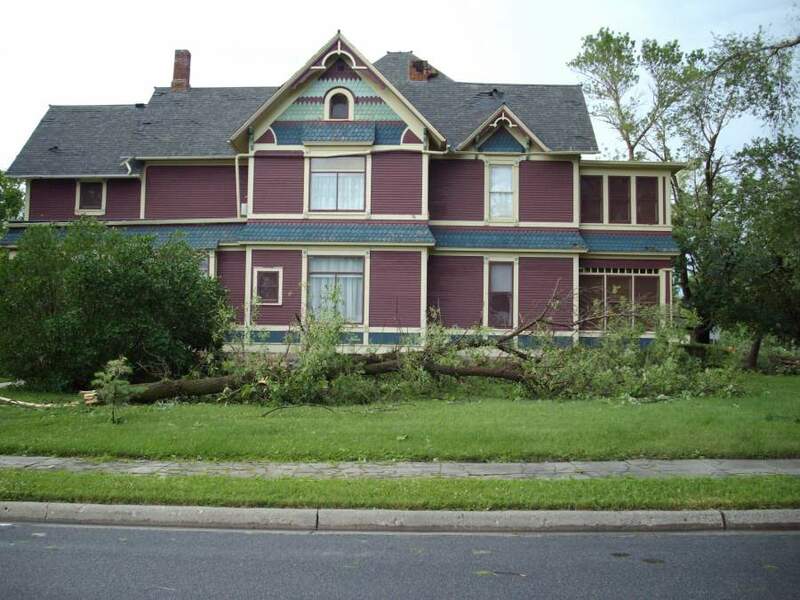 The Johnsons' 1898 house was damaged inside and out by last Friday's tornado. DeLores offered to take photos of the interior for me, but I figured she had enough to do without adding this to her list. 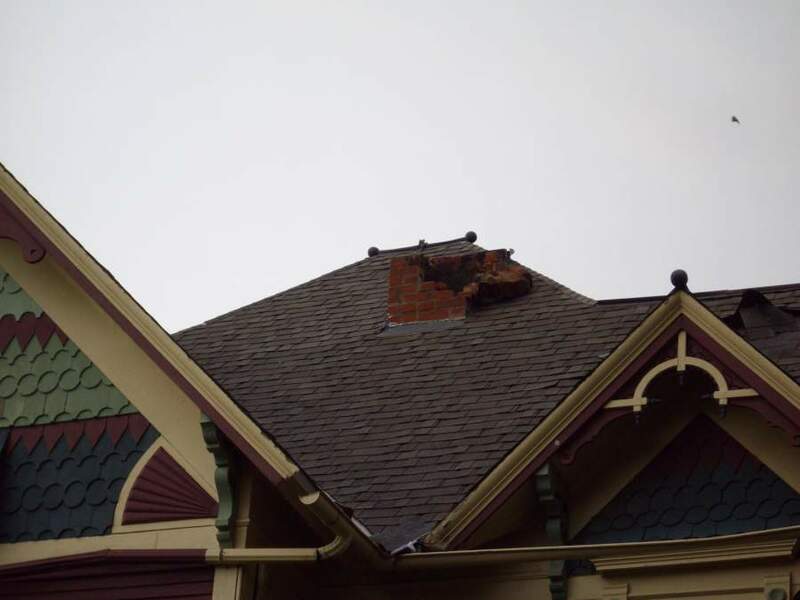 A view of the house roof where the chimney was ripped off by the tornado. DeLores shares some interesting details about the storm. “The wind blew water through the air conditioner in the bedroom upstairs and blew the water so it ran across the hall into another bedroom. It soaked up the carpet in the hallway and that in turn ran down into our living room. And that’s just the house. 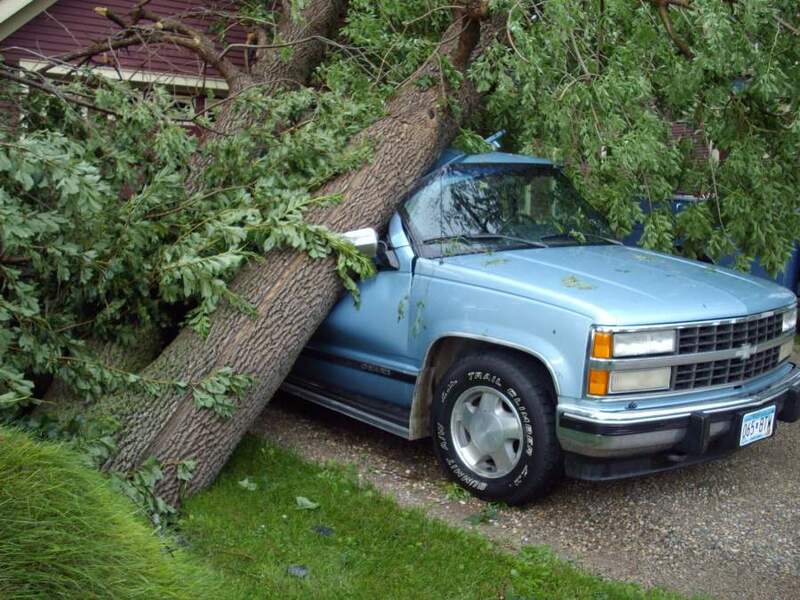 The garage received structural damage when a tree toppled onto it and onto Tom’s SUV. His vehicle was totaled. A tree fell onto the garage and Tom's SUV, which was totaled. The Johnsons lost nine trees, some of which fell onto a 100-year-old fence that DeLores says they’ve lovingly protected for years. One of several trees that landed on the 100-year-old fence. One of numerous downed trees. Despite the severe damage to home and property, DeLores is grateful that they survived the storm. Marilyn and her husband, Dan, had just arrived at a west-central Minnesota lake for the July Fourth weekend when an EF-1 tornado hit their Redwood County farm one week ago today. Since then, with the help of family and residents from Cottonwood, the Schmidts are cleaning up. Click here to read a previous post about the storm damage at their place. Their son, Matt, was at the farm with a crew on Thursday when Marilyn emailed. She tells me that all of their neighbors to the south and east and some north and some west had major damage to their properties. The Schmidts’ insurance adjuster already had gotten 1,500 claims by Tuesday night. 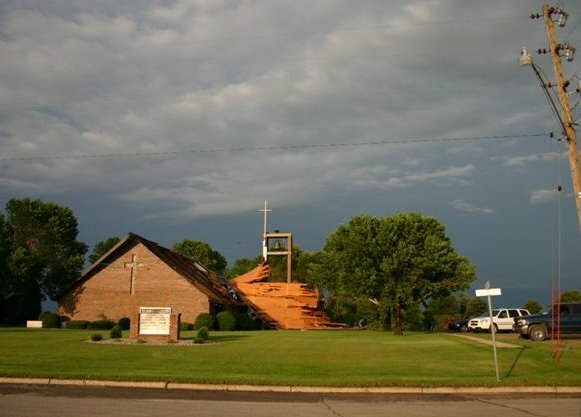 IN VESTA, WHERE A SERIES OF DOWNBURSTS with wind speeds of 90 – 100 mph caused significant damage and downed trees, members of St. John’s Lutheran Church are planning to repair their church. The south half of the church roof was lifted off and slammed against the bell tower, according to my uncle, Milan Stage, a church member. The tower was cracked at the base and will need to be taken down, he says. Everything has been removed from the sanctuary into the attached social hall. The congregation is awaiting reports from an insurance adjuster and two contractors who have been on-site. Milan says the west end and sides of St. John’s appear to be alright, but that “It will be a slow process getting the church back in use.” The church council met Wednesday evening and decided, if funds are available, to remodel the church along with repairing it. In the meantime, congregational members will worship at their sister church, Peace, in nearby Echo. Across town at Uncle Milan and Aunt Jeanette’s home, the high winds wrecked eave troughs and a deck railing. A branch went through the railing, taking half of the railing and the grill with it, Milan says. Tops were snapped from some ash trees in the Stages’ back yard. Branches from their big cottonwood tree were strewn across the lawn. JUST A BLOCK TO THE SOUTH my 79-year-old mom, Arlene Kletscher, never made it to the basement during the storm. She was sitting in her living room sorting through papers and wanted to complete the task. In her closed-up, air conditioned house, she never heard the warning sirens. By the time she realized the severity of the situation, it was already too late to seek safety. This marks the second time my mom has not gotten to safety during a severe storm. Thirty some years ago a tornado hit our home farm, where she was living at the time. Then a silo was downed, wagons strewn across the field, among other destruction. I am thankful, again, that she is OK.
My mom’s Vesta home was apparently unscathed. 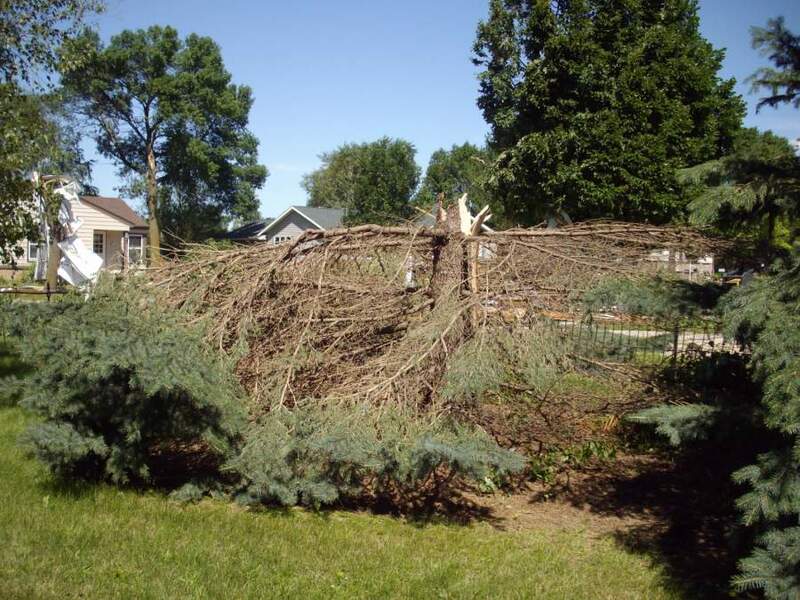 However, she lost one tree and her yard was littered with branches and other debris. READERS, THANK YOU for following my series of storm stories which began last Saturday. Yesterday Minnesota Prairie Roots’ views reached an all-time daily high of 1,443. That indicates to me a continued strong interest in the storms of southwestern Minnesota. I know several of you have posted links to my blogs on Facebook. Thank you for doing that and also thanks to those who have shared their stories and photos. If you’re reading this and have a storm-related story to share, please submit a comment. If you missed my earlier storm posts, check my archives. Many of those stories include links to more storm information and images.